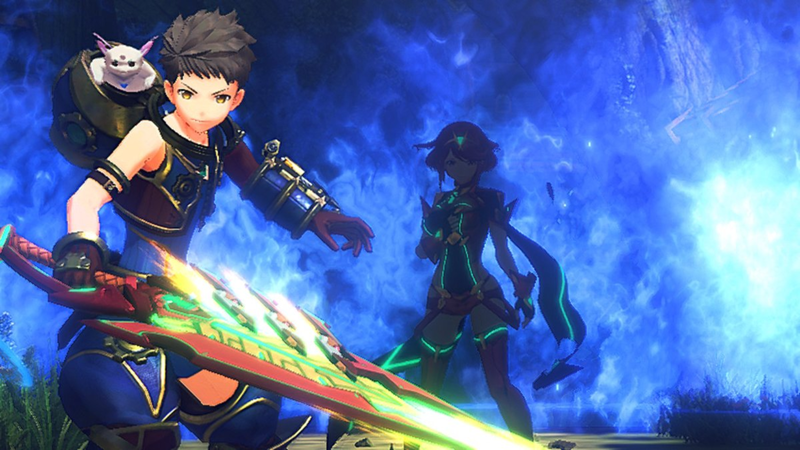 I had always just assumed I would love Xenoblade Chronicles 2. I’ve been a fan of the series since the original on the Wii, which captured my heart and imagination with its sweeping existential plot, and jaw-dropping world design. The setting, a world built upon the bodies of two dead giants eternally locked in combat, was like nothing I’d seen before. The game captured a sense of scale that others would struggle to capture - viewing a vista upon a mountaintop in Skyrim, for example, had nothing compared to running through Gaur Plains and seeing the Mechonis and its sword stretching, colossal, across the sky above. Oh, and speaking of Gaur Plains, the music was phenomenal. Then Xenoblade Chronicles X came along, which I championed as one of the Wii U’s greatest titles. The vast, open world was incredible to explore, the skells (literally Transformers) were a thrill to pilot, and I found joy observing the way in which the world would gradually transform in tangible ways. It felt alive and bold, perhaps a direct result of the way it combined both Japanese and Western game design sensibilities. My excitement was at peak levels when I first saw the E3 Presentation trailer for the third title in the series, Xenoblade Chronicles 2. Just look at it! The visuals are better than ever before (an improvement over X which was, admittedly, firmly set within the uncanny valley), the music continued to be amazing, and the setting looked to be as fascinating as its predecessors, with a return to the living-on-the-back-of-a-giant thing. Only this time the giants are alive, and you can see their heads move in the sky above you as you run through the Gormott Province, the game’s version of Gaur Plains. I wonder if our pokey little feet make them itch as we run? My mind was rife with questions, and my chest filled with excitement. I patiently waited for the day in which I would be able to play the game for myself, safe in the knowledge that it was going to be a worthy continuation of the series, and another great title to grace the Nintendo Switch. Then I got my hands on the game, carefully placed that tiny little cartridge into my Switch, and began to play my first few hours… and I was underwhelmed. I gave it a few more hours (around seven in total, which is admittedly not very many by JRPG standards) but it just wasn’t clicking. I struggled for some time to figure out why - why?! I did indeed love the art style, the world was as fascinating and beautiful as I had expected, but why did I end up feeling bored during each play session? And then, the battle system. I felt like it boiled down to approaching an enemy, letting the characters auto-attack, waiting for a chance to execute an art or special move, and waiting some more. It felt very disengaging, and I did not feel like my input was necessary at all. Saddened and frustrated by my inability to connect with the game, I placed it back in its case and didn’t touch it again for another nine months. Cut to, more or less, present day. My life has changed dramatically - in June I left my quiet mountain home in Wales to live with my fiancée (now wife) in Massachusetts, America. This is without a doubt the best thing I’ve ever done, but I am unable to work until I am given a work permit which can take up to five months to process. Suffice to say, I have a lot of time on my hands, especially time spent alone whilst my wife is at university and working. This quiet time lead to a desire to embark upon an epic (digital) adventure, with companions and friends I would grow with and come to love. I tried a couple of other games, namely World of Final Fantasy on the PS Vita, but I while entertaining it wasn’t presenting me with the fully engrossing world I desired. Tentatively, and with some trepidation, I placed the Xenoblade Chronicles 2 cartridge back into my Switch… and what is this?! Almost instantly, the game clicked. I rescued a certain character from a certain dubious organisation (early game stuff, but I’ll avoid specific spoilers), and spent some hours completing side quests in the first big town the game presents you with. Through the flow of the in-game days and nights, I found a sense of place. I enjoyed the rhythm of the quests, and seeing things in the game world shift and change slightly following my actions felt extremely rewarding. Through the little details, such as NPC’s having new dialogue in response to in-game events, the cloud sea lowering and rising, covering and revealing land by its own whim, the ever-changing weather, and collecting and empowering blades (blades being living, often humanoid beings that kind of are your weapons) through an addictive gachapon-like system - the game well and truly had me within its grasp. Following this, I was forced to reassess my biggest faults found during my original attempt to play the game. I really don’t know what changed with regards to the characters. Maybe I just needed more time with them? Rex, while still pretty generic at the moment, is optimistic and likeable enough, and his Yorkshire accent ends up being far more charming than it is clumsy. Speaking of accents, and maybe this is a slight amount of homesickness speaking, but every time Nia’s Welsh accent graces my ears I feel comforted. I also feel motivated to journey further into the world presented in the hopes of visiting her home, and her people. Maybe I’ll find that a mini Wales upon a whale awaits me. Even Tora, the token Nopon character, has wormed his way into my heart. 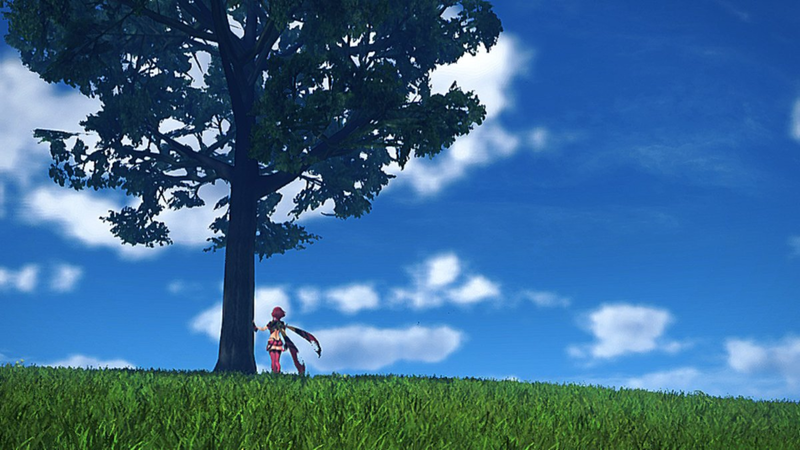 He feels legitimately useful, which helps, and his self-crafted blade Poppi is an addictive gameplay mechanic of her own, providing the most customisation out of any of the blades I’ve encountered so far. This, then, leads into the combat. As I played more and focused on developing these blades, I discovered the nuances of the battle system. It is true that the game locks away, or at least doesn’t explain certain mechanics until nearly 20 hours into the game, but once these start to be highlighted, the depth of the systems becomes abundantly clear. Where once I felt I was playing the game on auto-pilot, waiting for cooldowns and button prompts, now I feel like I am playing an almost overwhelming blend of rhythm based button presses, character positioning, blade switching and combination attacks involving each active party member. The game is alive with action, character, soaring beauty, and meticulously crafted gameplay loops designed to pull you in head first. I can’t deny that the opening 10 hours could perhaps have used a few more spoons, or perhaps a ladle, in its approach to spoon-feeding the player information, but now that it has done that and I’m free to explore and lose myself in the depths of this world - I’m in love. I am existing within this game, as one does with any great game, and where I had previously felt I was stumbling and resisting against what the game was presenting, I feel I have fully embraced it and I’ve allowed it to craft its world and tell its tale. All this is to say, second chances should always be considered. My initial experience may have resulted in a bad review, but in giving it some time and acceptance the game has flourished. I cannot wait to resume my adventure (which, rest assured, I intend to do the moment I have finished editing this), and I can’t help but be excited to see what other games I can give a second chance and rediscover.